Sometimes you just want to hang loose with your knitting and let your mind wander, but not endless garter stitch. This reversible light summer scarf is knit lengthwise to get into a rhythm. 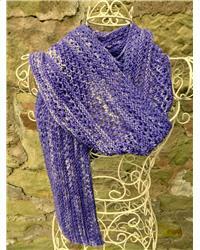 It features three different but easy to remember open work/lace stitch patterns. Both sides are attractive – I actually prefer the 'wrong' side. Knit on large needles to make the lacy patterns really open up, give drape and also give a lot of ‘bang for your buck’ – perfect to showcase that single skein of special yarn. Project Size: 7" x 72"